I admit that one of the reasons for setting up this blog was that I had gotten tired of answering the same question more than once, even if asked by different people. The other danger of talking to bloggers is that you might find yourself as a character in one of my next stories. This entry was posted in Life, Technology and tagged blog, blogging. Bookmark the permalink. 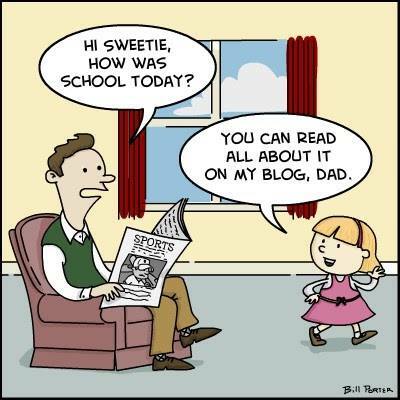 [ Laughs ] Being a blogger, I can relate to that cartoon. And it’s really sad when close friends or relatives ask questions that show that they haven’t read what we wrote about, isn’t it? [ Smiles ] Yes, it is, Andreas.